"I had many old reels form early 60’s to mid 70’s, some in B/W, some in color, some with soundtrack some silent. And in 8mm as well as Single8. The results ..."
Every family has thousands of pictures and videos in dozens of formats, analog and digital. Our goal is to help your family organize your collection into a coherent archive. We simplified a complex problem into their component parts, analog and digital. Comprising of photos and videos primarily from the 20th century, includes popular formats like: paper prints, 8mm film, slides, negatives, as well as various tape formats like VHS and Hi-8. Each format is digitized and uploaded to the free memorable app, where we find a date for each video or group of photos. If a date is not known, you can always set it within the app or invite a family member to help. Memories from the 21st century are commonly stored on computers, PC or Mac, devices, iOS or Android, as well as DVD’s and memory cards. Our software uploads files from these locations, retrieves the date information, and organizes it automatically in chronological order, along with a searchable tag like original folder and subfolder names. 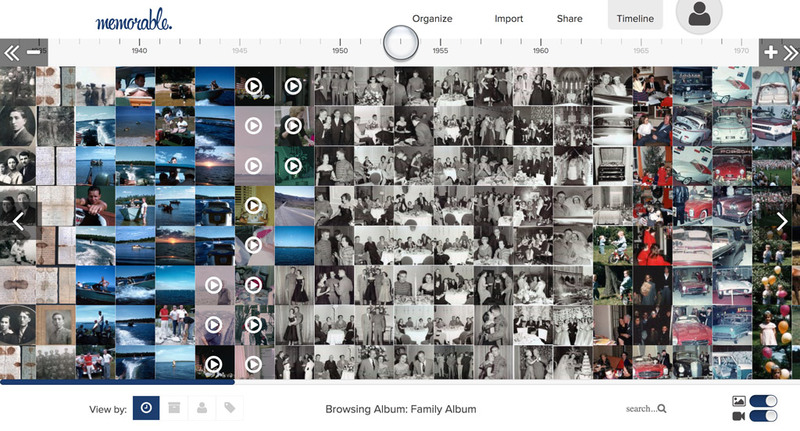 Together, analog and digital unites your family memories into a single archive from which you can view, share, and edit your life in pictures.